Ouya Everywhere is the official version running around on systems like the Madcatz Mojo , Xiaomi Mi Box, and now the Razor consoles. But Ouya Everywhere is only given to those boxes which are certified by Ouya/Razor to get the special feature installed onto them. S, This is rather old and all of the developers have moved onto Google Play, is this even relevant anymore? While it is true that a lot of the developers have moved onto bigger and better things. The Ouya Discover still has a rather good emulation collection that you would otherwise pay for on google play. On top of that to those which have bought games on Ouya you can go back to those games to keep playing them if you so desire. Lets go through the advantages of Ouya Everywhere and Ouya Anywhere. Before we even begin. I want to point out some details so everyone knows what to expect when installing Ouya Anywhere and the differences between Ouya Anywhere and Ouya Everywhere. only %40 percent of the library is available on Ouya Everywhere. This is because there’s another level of quality control that must be passed in over for a piece of software to the published onto it. It’s only available for a handful of systems which have received permission from Ouya over the years to attain it. Ouya Everywhere framework is up to date and does not have any massive glitching. All games are available through Ouya Anywhere. However, with zero quality control what so ever so it turns into a “Play at your own Risk” type of environment. Bizzare glitches can occur with Ouya Anywhere due to the multitude of different environments for Android OS. On Cyanogen 11 alone screens so not resize properly to a lower resolution like it does on the stock Ouya OS. Because the Ouya Anywhere is based around the Abominable Snowman release of Ouyas firmware. Known glitches can occur such as preview videos automatically playing in full screen and having to move off of the first picture in order to play it. Not all of Ouya functionality such as the keyboard, the ability to sleep, the ability to reboot the OS, the ability to go into settings from the manage menu. Ouya Anywhere does not provide any means of transferring your APKs to a external storage device such as USB stick. This will make certain games very difficult to deal with as they may have up to a 1GB download size to them requiring almost all of the internal storage of your Ouya to decompress and install them. Also with the Abominable Snowmen release there is no tutorials underneath MAKE and BUILDS. Because of the array of different DRM and anti-piracy countermeasures that are placed into the APKs your registered or paid programs may not react properly underneath an Ouya Anywhere environment. For the longest time the most popular Ouya game bombsquad would kick you out in under 5 seconds because it checks to see if you are playing on a legit Ouya. 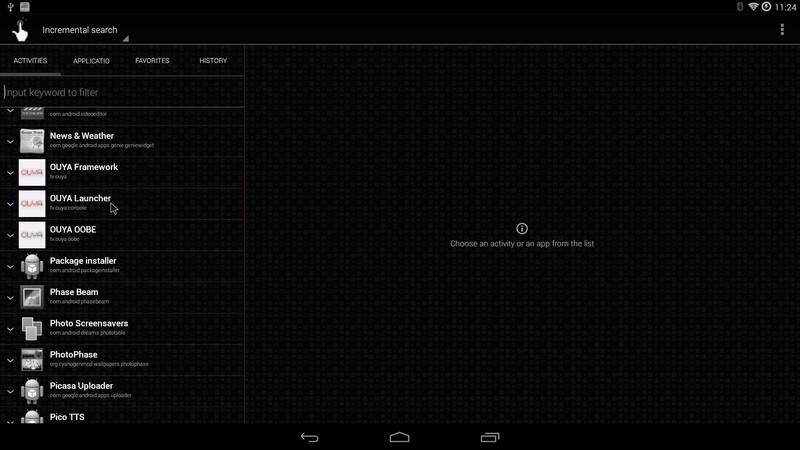 With the introduction of Razor it instead links to your android account instead. Newer versions of Ouya Anywhere. But if anyone figures out how to update Ouya Anywhere the hard way I would love to know. How long can Ouya Anywhere work without updates? That comes right down to what Razor is going to do with the Ouya servers that the framework talks to. Razor initially was initially talking about keeping the servers active for a year during the acquisition announcement in June of 2015. It is unknown if they will continue the service beyond that point. Prerequisites for installation of Ouya Anywhere. An android box with superuser access connected to the net. In this tutorial we are going to assume that you have already ran the CyanogenMod for Ouya tutorial and you are here to re-add the functionality of the store back onto it. You may try this on other Android boxes but your effectiveness and compatibility will vary greatly. I have provided to everyone a link so you can download all of the APKs that we will be using for this tutorial. Please extract them and upload them into the /sdcard/download section of your Android device as we will be using that as a reference point when we refer to these files. After you have downloaded the zip file and extracted to your android/Ouya based system we are going to open up a file explorer. I like using Root Explorer the most because you can also look into and unzip files with it if necessary. But you can choose whatever file explorer you like. After going to your /sdcard/download section you should find the three primary APKs we want to install Ouya anywhere. 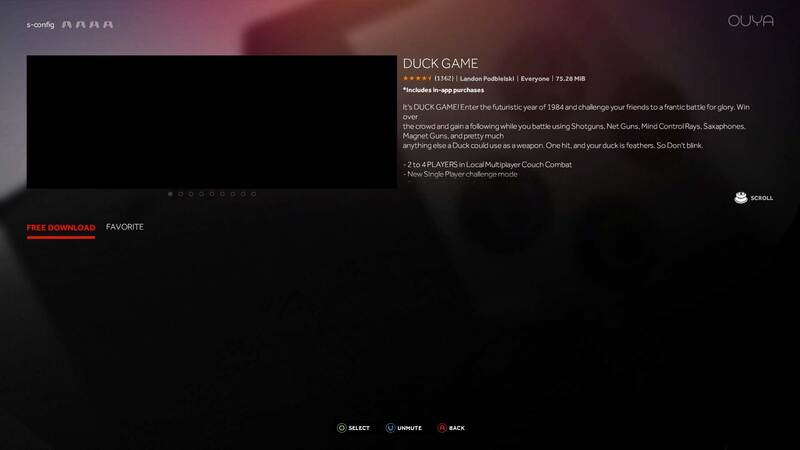 The tv.ouya.apk (framework) , the tv.ouya.console.apk(launcher) and finally, the tv.ouya.oobe.apk. Click on one of the APKs to begin installation. 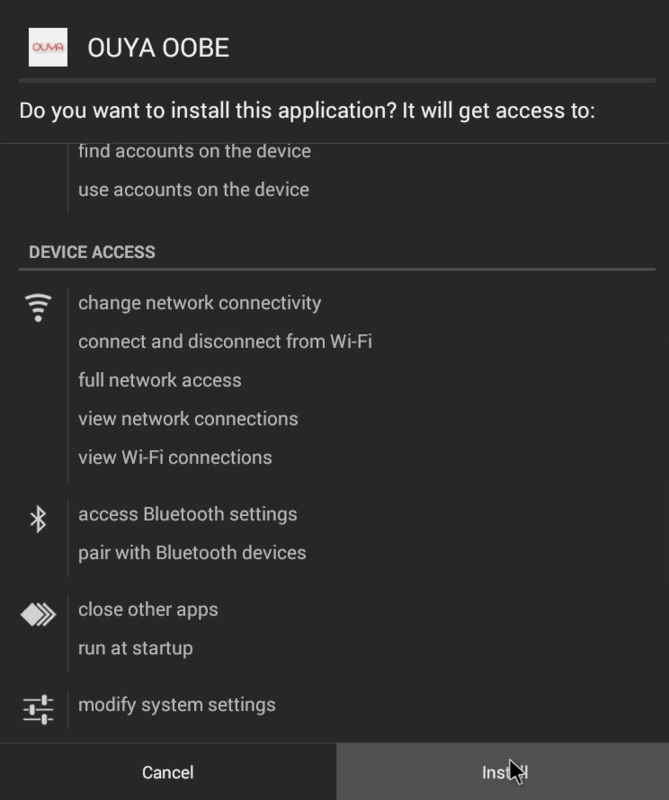 Android is warning us what all these APKs will access which is a lot of system functionality. This is normal and the reason why you require SU access to do this. Click the Install button. Click done on installing these APKs . 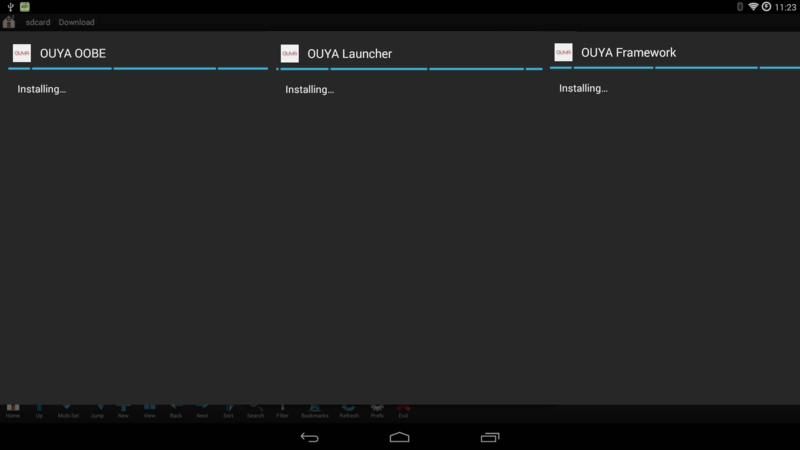 Do not click open as we will be accessing the Ouya Launcher in a different way then the explorer. 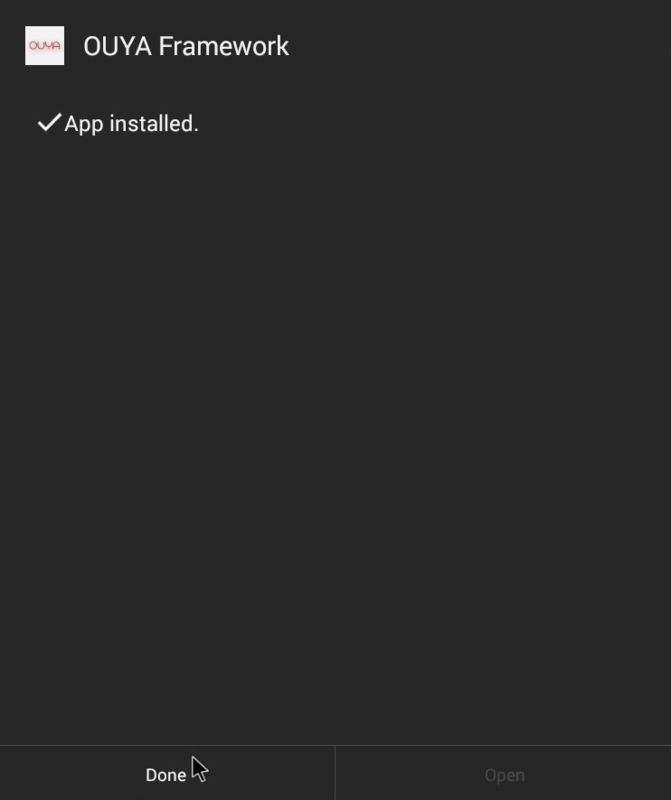 Repeat the steps for the other two APKs until all three of them are installed onto your Android/Ouya Cyanogen box. and then you may exit out of whatever file explorer system that you used. 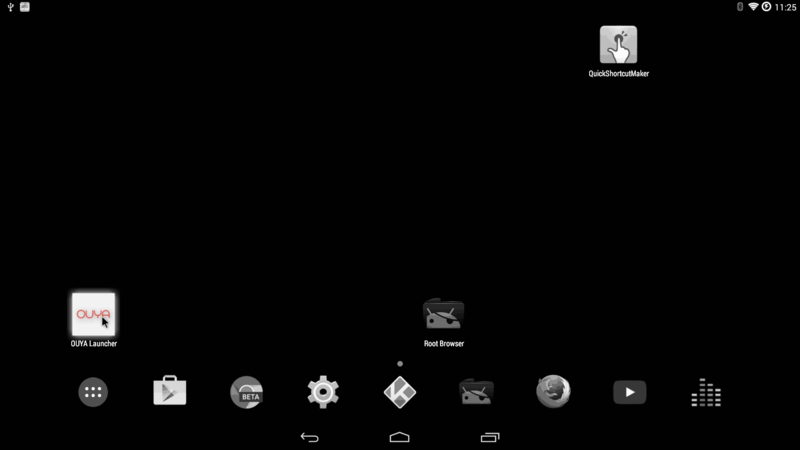 You have probably noticed that if you go back to your android desktop that you cannot find the Ouya icon to actually fire up the launcher. That is because since it’s designed for development mode that it doesn’t place the launcher anywhere but instead at least installs all of the framework so that people who write code can beta-test their APKs off of a near-ouya level framework. Make sure it can check DRM , payments, etc. However, the Ouya Launcher is buried in this dev copy we just have to pull it out. To accomplish this task we will need to download another program off of Google Play called QuickShortcutMaker which will do all of the heavy lifting for us here. Click to launch it. The first thing QuickShortcutMaker will do is begin cataloging all of the APKs that are currently installed onto your Android Box. Scroll down until you can find Ouya Launcher and then click on that. 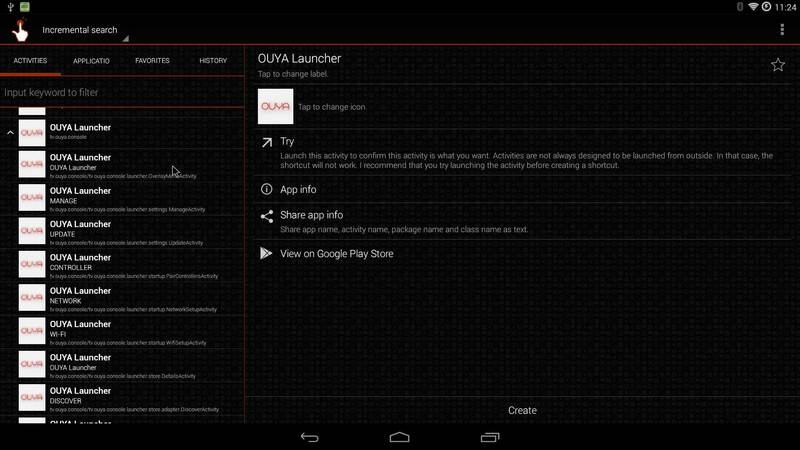 It will then display all of the ‘activities’ within the APK that we can possibly link a shoutcut to, you need only go one down and select the Ouya Launcher again. 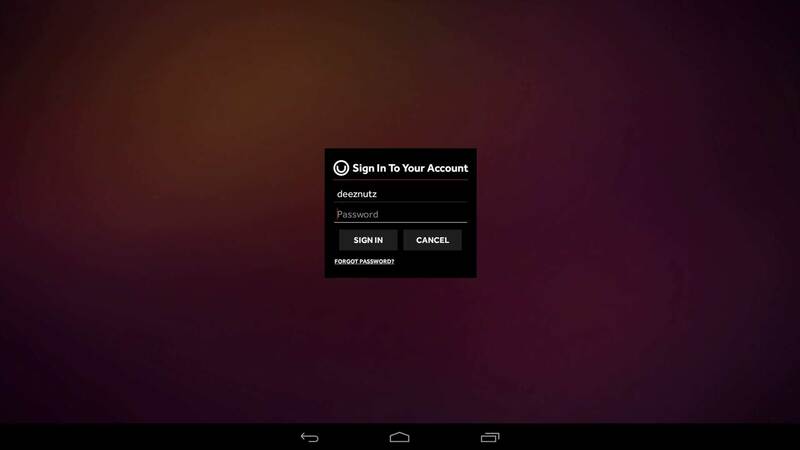 If you want to verify this is the correct activity you may press the “Try” button to launch that activity within the APK, you should be greeted with a Superuser access screen and then the Ouya Login. If you are satisfied with the selection you can window-out of the Ouya Launcher and click the “Create” button to place this icon onto your tabs within android. Now that the Ouya Launcher is on the desktop we can simply click it to jump right in. 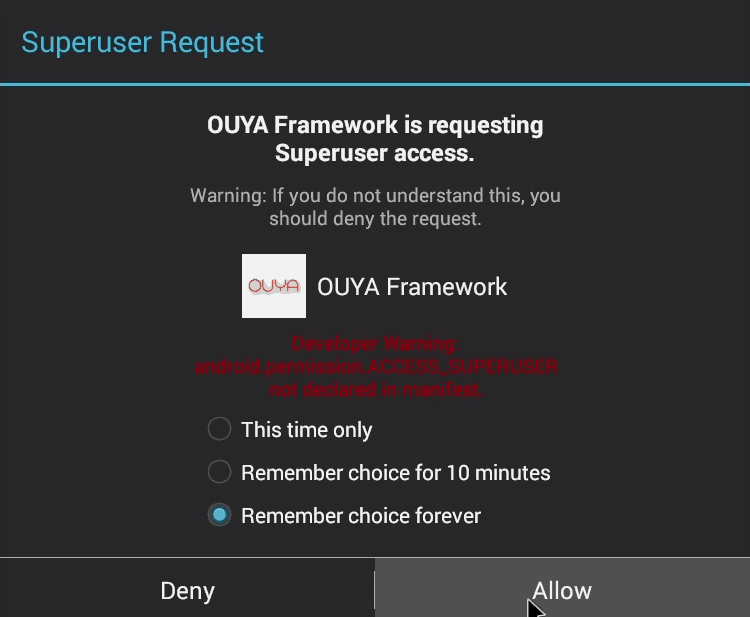 Upon first launch it will immediately request that Ouya Framework attain superuser rights. This is highly important because without those rights it will not be able to login and verify your Ouya account. Click “Remember choice forever” and then “Allow” the action. If you are successful you are greeted with something that you may be a little more familiar with if you had played with a stock Ouya which is your infamous purple login screen. 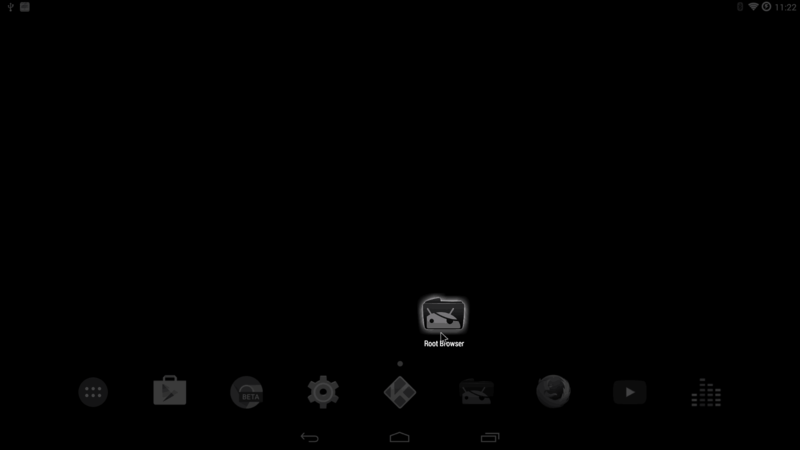 it doesn’t ask you to pair any controllers because Android/Cyanogen should technically be taking care of all of that. 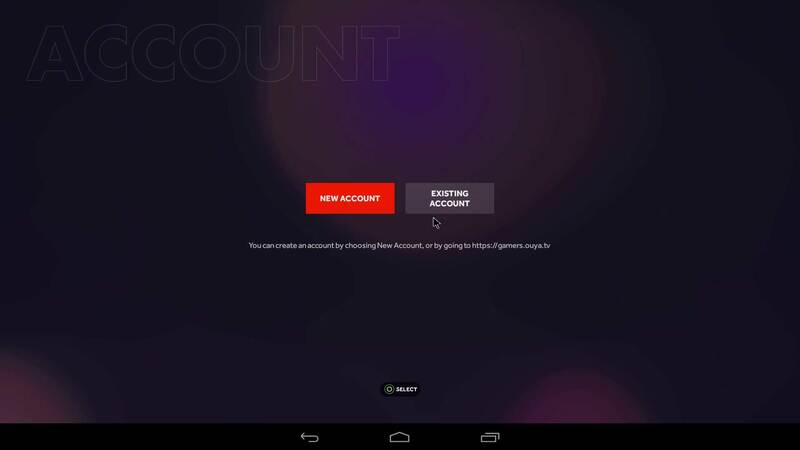 Note: If you are generating an Ouya account for the first time it will ask for a credit card. Use this link from Paypal to inject your own test credit card numbers into your account. I never agreed with Ouya’s insistence of owning credit card information during an age where large establishments like Sony are getting hacked every single day. Once logged in you are free to wonder about and choose things like the “DISCOVER” store where you get to see that the icons got really really small! Special notes about the video glitch. There’s a super-annoying glitch in Ouya Anywhere where if you look at the details of a a particular game it immediately launches a video in full screen. This is because Ouya Anywhere is based around the Abominable Snowmen release of the firmware which had this glitch in it as well. To work around this simply move up and move the preview picture over to another frame where it just shows still images of the game. 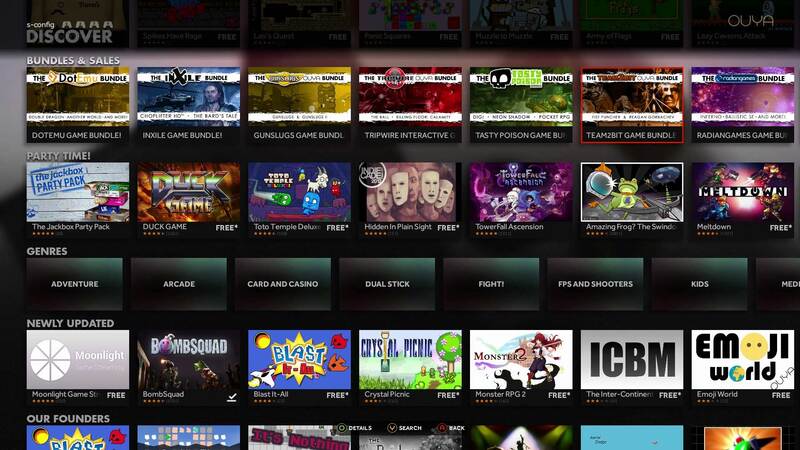 This will buy you enough time to select the game you want to download and back out as quickly as possible. Notes about size and video glitches within Ouya Anywhere. I should note that this only happens with the Cyanogen Modded Ouya. I tested this on an Nvidia Shield as well as a Samsung Galaxy Note 8 and the dimensions of Ouya sync back up to a more normal and proportionate sized screen. Also, the video problem seems to go away on both android boxes. Finally, be sure and give OOBE and the Ouya Framework SuperUser access if at all possible. Failure to do so will result in DRM locked games to fail during authentication. 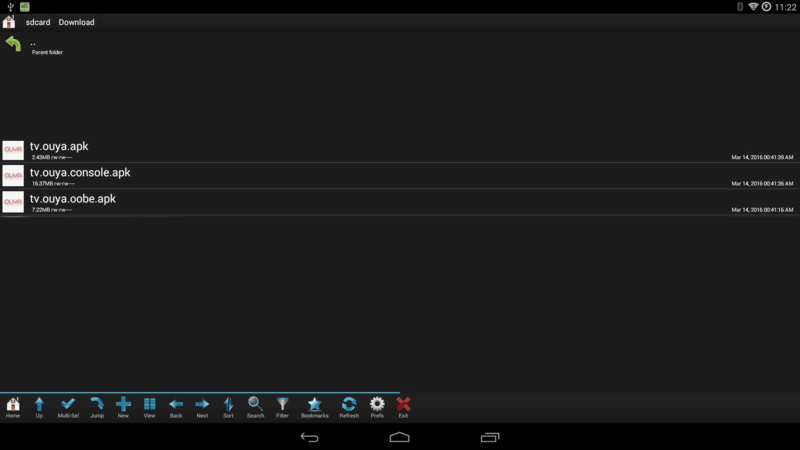 Launching from stock Cyanogen Trebuchet desktop. Even though you have installed APKs off of the Ouya Launcher does not mean you have to use the clunky UI to play games from said launcher. 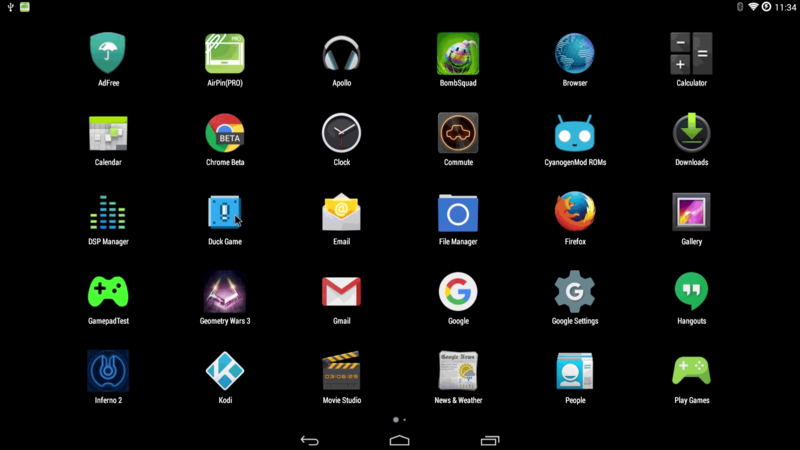 In this screenshot the duck game icon is located in my Apps in CyanogenMods Trebuchet desktop. Even if a launch it from here it will go out to and ask the Ouya Framework APK if I am a legit user. It will respond that I am and continue to happily let me play Duck Game. Every DRM is different so some games will let you run like this while others will lock you out hard! Also note with Duck Game. The Xbox 360 controllers with it since I was able to press the ‘start’ button to play versus the ‘U’ back button which forces trebuchet to exit out of an app. I also wanted to note that when you back out of an app for the first time Cyanogen at least will ask which home app you want since Ouya Launcher is technically a home app. I advise keeping Trebuchet as your default as that is also responsible for activating your Bluetooth adapter for joystick control. This would be considered part 2 of 2 of the Ouya Anywhere tutorial but it mostly shows the performance and glitches within Cyanogen during gameplay. Throughout my ownership of Ouya and dealing with the Company Ouya Inc. These three APKs are probably the biggest screaming fit I could possibly have with the management of that company and why it ultimately failed. Because here you have an app that it capable of opening the doors to new users to come in and try/buy games from developers who desperately want said user-base and money however, instead of perfecting this APK to bring it to public release they sat on it as Ouya hardware began to dry up at stores such as Target in the Americas. With a stagnent base and no new hardware really hitting the shelves such as an Ouya 2. It is no wonder why the company as a whole went belly up. It was never my intention of making a blog about Cyanogen for the soul purpose of stealing the userbase away from Ouya/Razor. In fact, the only thing they could’ve done to make my articles completely pointless is to release an android OTG upgrade for the box as it is apparent it can handle KitKat 4.4 . If you’re reading this Razor trust me, even at this time in 2016 you will STILL make thousands of people happy if you did this! Hell, maybe even 5.0 with careful memory management so we could get in on Android TV action. But I hope this blog serves as a purpose of still allowing users to access Ouyas Discover store without having to endure being on an outdated OS. It’s glitchy and the joystick mapping could be better. But at least I can still play Kodi AND access my paid games. At the time of this posting it isn’t too late Razor. At the very least you could Update “Ouya Everywhere” to be available on Google Play like the Moga Pivot if you so choose. Or you can continue to make more bad decisions for your user-base. I have no idea how long this “hack” will last boys and girls. My suggestion to you is download whatever free games you want and the back them up to a USB stick or something. Also take notes of all of the commercial games you bought and contact the developers of those games once or if the Ouya Servers go offline. Many developers are very accommodating to users which have actually purchased their software and will find a way for you to keep playing. 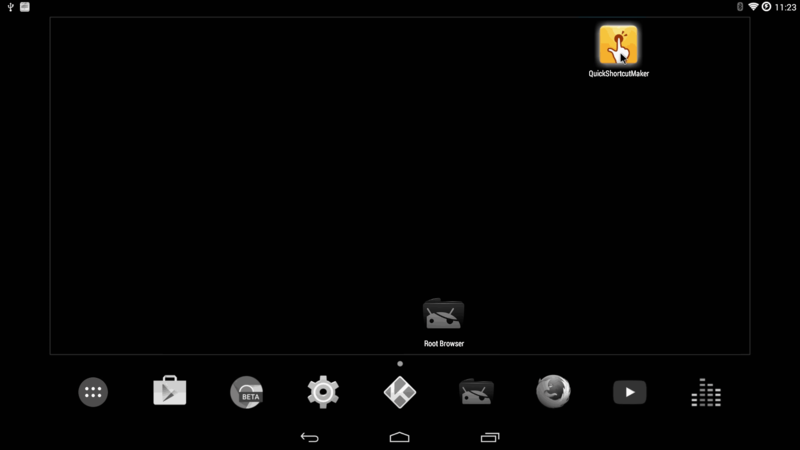 Want to know more about CyanogenMod and your Ouya? Click here to find out more! kudos on an excellent how-to. very easy to follow. I had a few issues with my Windows 10 machine but worked first time with Windows 7. I followed the how-to to install the Ouya launcher. the installation, again, very easy to follow. all three files installed as expected. However Ouya Framework and OOB keep crashing just after the launcher starts. I have been following your Ouya guides with great interest and have acquired another used console which had lineage OS installed, but I wished to revert back to the stock image. So I cloned the 1st original (which is still activated etc) to the other with ClockWorkModRecovery. My question is how does this framework work as I have tried renaming various folders manually in /data/system and rebooting and they get recreated upon boot with the fresh-install Welcome screen but renaming them back doesn’t restore the setup. Ouya framework I believe sets up a passwd database file and stores your credentials. I’m not entirely sure how to clone those credentials over to another android.. It would be be similar to say… transferring a google account over to another android system without knowing its username or password. It’s just something I’ve never really tried.. Thanks for checking out my blog about this however.